Portable Tailgate Bar Design Scores a Touchdown! It’s the second week of NFL tailgating season and if you’ve already been to your favorite stadium (ours is Lambeau Field, just 5 miles away) and like to tailgate for the big game, then you might be finding out how much you really need to build your own portable party bar. We’re here to help! build your own portable bar – comes in L-shaped version too! 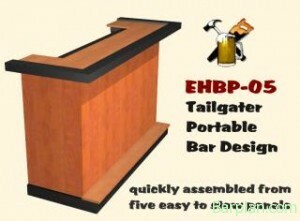 The EHBP-05 Portable Tailgate Bar is just one of the cool bar plans you get when you join our home bar design & construction website. It’s the perfect bar for the autumn football season since it can come along with you to every home game. But wait, how can you bring along a 6 foot bar? It’s EASY!, the bar quickly dis-assembles into 5 flat panels and one storage box that will fit in most vehicles. Even if you drive a smaller car, the CHBD bar resizing tool included with your membership will allow you to nominally shorten the bar so it will custom fit your ride. The minute you break out this baby, you’ll have people from all over stopping by to check it out. That’s not all, the EHBP-07 is also a portable design, but it’s an L-shape model. It takes more space but is still well suited for trucks, vans and RV stowage. BOTH plans along with many more are included with a one time membership fee to the Easy Home Bar Plans site.